Luggage handlers emptying the hold of a Qantas Airways flight in Melbourne, Australia, got a shock when they found a that a crocodile in transit had escaped its storage box. The animal had managed to become loose after it was boarded on to a two-hour flight from Brisbane, Australia, on September 17. An airline spokeswoman, Lauren Blank, said that the company is closely examining how the incident occurred. She said: "The animal was quickly and safely secured when the aircraft arrived in Melbourne. The investigation is focusing on whether it had been loaded appropriately on delivery to Australian air Express (AaE)." Australian air Express, the company responsible for looking after the cargo of its own planes in addition to Qantas and Jetstar aircraft, declined to speak to the press. 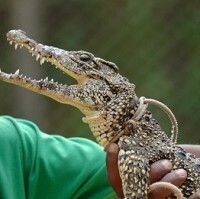 Its online terms and conditions state that animals, including certain reptiles, can be taken on board as cargo, but must be securely locked to avoid any likelihood of the animal becoming loose. Pet owners transporting their animals by plane may require specialised travel insurance.